One particular fungus really begins to shine this time of year when hardly a mushroom wishes to poke its fruiting body from the earth. I am referring to the aptly named Turkey Tail fungus (Trametes versicolor). Turkey Tail is not difficult to locate, as it’s one of the most ubiquitous fungi found in our woodlands. Look around at the logs, stumps, and fallen branches in your neck of the woods – and you may eventually discover Turkey Tail. It’s not necessarily edible (too tough), though it sure is medicinal. One particular study found that Turkey Tail can improve immune system status in immuno-compromised breast cancer patients following conventional cancer treatment (Torkelson et al., 2012). These findings are extremely important, as the study was not conducted on animals, nor in petri dishes, but rather on living human subjects. A more recent human trial (again – not in animals, nor in petri dishes) found that a polysaccharide extracted from Turkey Tail mycelia displayed prebiotic effects in the human microbiome (stimulating the growth and maintenance of beneficial intestinal bacteria). In the same study, participants who were instead fed Amoxicillin (an antibiotic) demonstrated detrimental shifts towards more pathogenic bacteria in their microbiome, with effects lasting up to 42 days after their final antibiotic dose (Pallav et al., 2014). Antibiotics are among the most commonly prescribed drugs used in conventional medicine. According to the CDC, up to 50% of all antibiotics prescribed are not needed or not optimally effective. The threat of antibiotic overuse is massive, of which the worldwide problem of antibiotic resistance is but one manifestation. Additionally, Clostridium difficile infections are on the rise due to overuse of antibiotics, leading to numerous preventable deaths. A wise first-line strategy would be to optimize our intestinal flora as best we can, and it seems that Turkey Tail may be able to help. Its medicine is easy to acquire. Hot water decoctions can be created and sipped as a tea, or simmered in broth and consumed as a soup. Additionally, dual extractions can be created, first in alcohol, then in hot water, and finally combined. 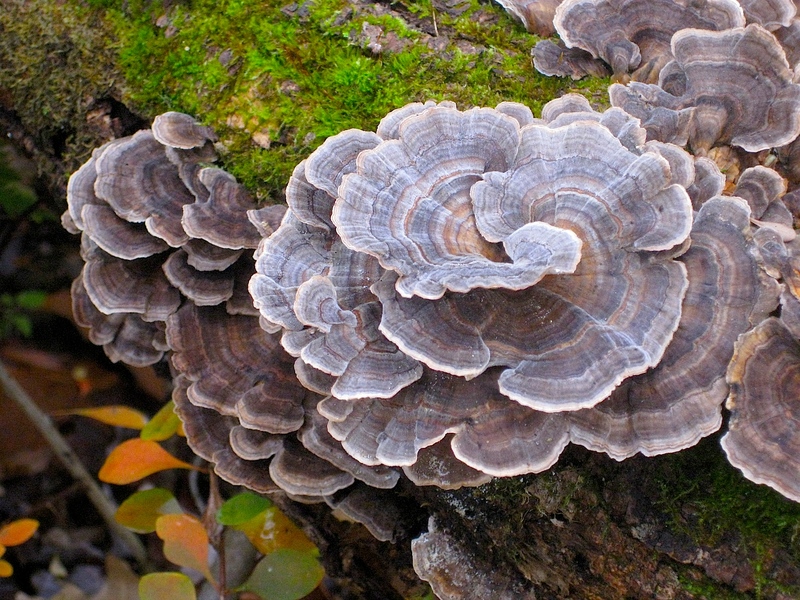 Turkey Tail is a great mushroom to hunt in the late autumn and winter months. While there are look-alikes, most are benign. Happy fall foraging! One of my favorite mushrooms!